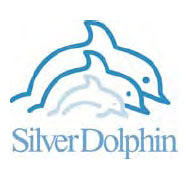 Glance at the Silver Dolphin Book catalog and you will find a vast array of interactive, educational and entertaining books for children of all ages. Silver Dolphin books are anything but ordinary. From pop-ups to books with kits and components, the hands-on books are all about exploration, ready to please and delight those curious kiddos. Take note, these fine books would make excellent gifts! Thanks to Silver Dolphin we had the chance to try out a couple great books. Ok, I admit I requested this one specifically with my husband in mind. His father is a retired aircraft mechanic so he spent his childhood surrounded by planes. Flight Test Lab: Airplanes is actually a really neat airplane kit which includes a paperback book explaining everything there is to know about airplanes and flight. Part toy, part book -- lots and lots of fun and very educational! 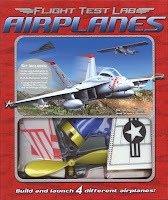 You can build your own airplane with 15 different mix-and-match parts included in the kit allowing for the creation of these 4 rubber-band powered airplanes: a Super Hornet, a private jet, a 747, a WWII Fighter (or create your own design). The fuselage and framing parts are all hard plastic with the wings made of styrofoam. You can use the included battery powered winder to wind the propeller. On the first try our airplane flew the entire distance of our large living room. The paperback Pilot Handbook by Jackie Kramer and Stuart Arden is jam-packed with all things flight related. The first couple pages include a highly detailed diagram of a plane listing all the major parts, and a cockpit page spread shows the main instruments and monitors pilots need to fly. The book also covers the history and science of flight, explaining thrust, lift, drag and gravity along with the three axes of rotation and airfoils. Plenty to ponder in this book. Children interested in aviation will love this excellently illustrated overview of airplanes and flight. We're prepared for our visit to the EAA. Spring is here. Easter is coming up soon. Want something other than candy for those Easter baskets? The tiny but sophisticated, Easter Egg Hunt with its fancy pop-up pages would be the perfect addition. Both my kids think the book is pretty darn special. We don't own many pop-ups, but after reading this one with the kiddos I'm wondering why. They haven't destroyed it yet. Children will enjoy searching for missing Easter eggs with the all pop up animals - a flapping rooster, fluttering butterfly on a flower, drinking duck, and leaping lamb. Who could have hidden the eggs? My little guy loves to open and shut the colorful pages causing the animals to move. Definitely a daily read right now for him. My daughter likes the cute little Easter bunnies and makes a point to count all the hidden eggs each time she reads the book (she found 17 total). The mini book measures approximately 6 inches tall by 4-1/2 inches wide. Several Silver Dolphin books have won awards from Parents' Choice, Teacher's Choice, NAPPA, and iParenting Media. The Amazing Baby series is one of the larger Silver Dolphin series and currently includes 27 titles, mostly board books. The Snappy Sounds series is perfect for toddlers and preschoolers. I'd personally love to get my hands on one of The World of Inventors books, new this spring. So many options to choose from. This calls for a giveaway! Win a book, any book! Silver Dolphin has kindly offered to give one Brimful Curiosities reader a book of their choice from the Silver Dolphin catalog. To enter, visit Silver Dolphin and leave a comment with the title of the book you would choose if you won. What a great blog. So many gives a ways this is great! Please include me in your giveaway. I love the Amazing Baby Rock-a-bye Baby! by Emma Dodd & Mike Jolley, it would be great for me grandson. I'd pick Field Guide to Ocean Animals by Perry, Phyllis. Hard to choose! I think I'll say the Nature Trails Dinosaur book. The Amazing Baby line looks great too. Thanks for the give away! I follow you on twitter and twitters about you! Field Guide to Ocean Animals seems like a smart choice! Thank. Space by John Farndon is my fave (or I think it'd be my kids fave) but it was NOT an easy choice. ps. thanks for stopping by my blog. There are so many great books! But I would choose Easter Egg Hunt Book! I would choose the airplane book! I would love the Maurice Pledger’s Sounds of the Wild: Dinosaurs. My grandson would love this! Thank you! Field Guide to Rain Forest Animals by Nancy Honovich sounds like a good book for my grandson. Thank you for the chance to win it! The Field Guide books look great! My son would love The Field Guide to Rain Forest Animals. I would love to join your giveaway! The book that I would like to receive is Super Racing (A Cool Cars Book) by Pearl Bensimon. My son loves racing cars! I would love any of the Kaleidopops Books, they are perfect for my 5 year old! We also so live in WI and we homeschool! :) Glad I found your blog! I love Silver Dolphin books! If I win, I'd like Baby on the Move for my nephew. Follow you on Twitter and tweeted about this! I'd love to win Amazing Baby Rock-a-Bye Baby! SO many awesome looking books! I know my son would just love the Space: The Ultimate Guide to the Universe. Too Many fantastic choices. I think my daycare kiddos would love the Snappy Sounds Once Upon a Time by Derek Matthews. Thanks so much! Easy choice when I found Field Guide to Dinosaurs by Nancy Honovich on the site! My great nephew would go nuts over this book. The Field Guide to Rain Forest Animals looks really neat. I'd pick the Ultimate Guide to Space. 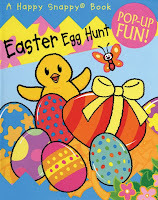 I would choose "Happy Snappy: Easter Egg Hunt" My kids love pop-up books! My son would love Crime Lab Trap the Spy. Mine would love Totally Bugs. He loves bugs! I would choose Spinning Globe World Atlas. My daughter would also like the 3-D Explorer: Oceans by Jen Green. From that series I would choose In the Ocean by Maurice Pledger and A.J. Wood. I'd love to read "History in Action within a Medieval Castle" My kids would love it! Great books, we'd love the Field Guide to Oceans Animals. Thanks! Extreme 3 D Scary bugs. Explore Within a Pirate Ship would be perfect for the boys. I like the Moving Windows: Wheels on the Bus because my daughter digs that song! My four year old would love the Field Guide to Ocean Animals. Very cool books! I would choose Explore Within a Pirate Ship by Paul Beck. Thanks for the great giveaway! My daughter would love Model Masters: Horses by Elizabeth Allen -- she's all about horses! Silver Dolphin has beautifully illustrated books, The Secret World of Unicorns by Pat Perrin caught my eye! I love the Kaleidopops Bugs book (and the Oceans and Wild Animals versions!). Field Guide to Dinosaurs by Nancy Honovich. I'd choose the Field Guide to Dinosaurs by Nancy Honovich. My son likes dinosaurs. I would select Field Guide to Dinosaurs by Nancy Honovich. My son would be thrilled! It's a toss up between scary bugs or airplanes. We'll flip for it if we win.